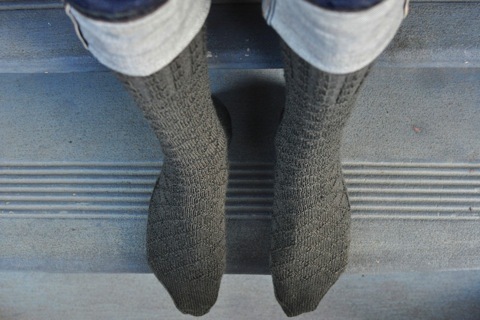 These socks were finished in April, but circumstances meant that I could only take photos of them yesterday. This meant that for about a month, I wouldn’t let Matt wear them for fear of them spontaneously disintegrating in his boots and thus going undocumented. Now that he has my blessing to wear them, they feel like they’re really finished. The results are pretty pleasing but I’m glad they’re done. This is mostly because I ended up knitting approximately three socks in the pursuit of making two. Part of this was to make sure the socks fit Matt’s skinny legs, but most of it was because I wasn’t paying attention at the appropriate moments. In the end, I only made two minor modifications; the legs are narrower than given in the pattern, and the feet are longer. When I first came across the pattern, I was drawn to the diamonds. Now that they’re done, the elements I like the most are the cuff and the faux seam that runs down the back of the sock. I think they look rather handsome and fancy up the socks just nicely. The yarn did an impressive job of keeping it together as it was continually frogged and knocked around in my bag as I took it to and from work. However, by the end of the first sock, the cuff was starting to look a bit fluffy and in need of a visit from the magic depiller (the honeymoon period is still not over). Both Matt and I are people of simple tastes when it comes to yarn colourways. The more solid (and closer to grey) the colourway, the more we seem to like it. So while picking charcoal Patonyle might seem a boring choice, I think the solid grey suited both the pattern and the recipient well. Let’s hope they don’t spontaneously disintegrate upon contact with his boots. love them! the faux seam is cherry on the cake for me, too! Absolutely beautiful socks Emma!! Hope they don’t disintegrate too quickly. Love the socks with the pattern, and they look like they ft him well. Lovely to see you in print! 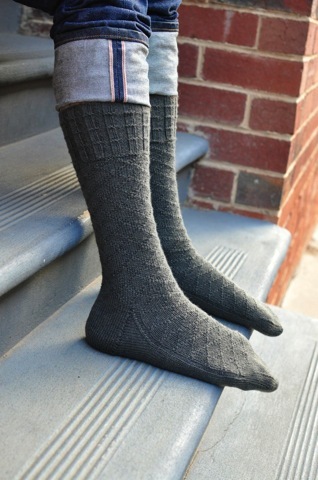 Lovely socks, nice pattern, great stitch definition and the colour makes it show up so well. I think my favourite part is the cuff too! They are awesome socks and look like they fit him really well, well done!